Please note that the Lexus Boutique will be closed for the Lunar New Year holidays on 4-6 February 2019 (Monday - Wednesday). Regular business hours will resume on Thursday, 7 February 2019. We apologise for any inconveniences caused and will like to wish all a prosperous Lunar New Year. An efficient combination of electricity & petrol. 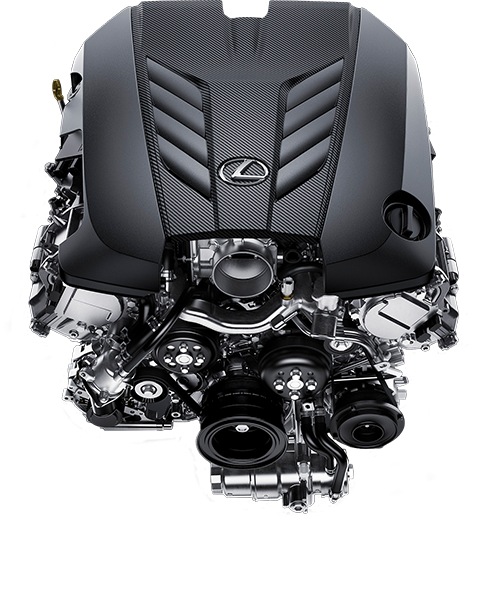 F vehicles represent the pinnacle of Lexus sports performance. F SPORT vehicles feature performance upgrades and sportier styling. The new in-house engine is changing expectations of a turbo. Vehicle specifications may vary by market. Contact your local dealer for more information. With an ultra-low center-of-gravity body, and wider tread and tires, the LC 500 strikes a sleek and seductive silhouette. Newly developed ultra-compact LED headlamps, arrowhead daytime running lights and a dynamic new spindle grille lend boldness to the LC 500’s front façade. A standard on the LC 500, is the carbon-fiber detailing, including a sleek carbon roof and inner-door panels. Expect pure brilliance when you turn on the LC 500’s elegant signature L-shaped tail lamps, made with 80 LEDs on each side which is created by an innovative multi-reflection effect using a one-way mirror. Newly developed run-flat tires grip the asphalt of your favourite roads, so you can keep on driving to a safe spot long after all the air has gone. For even greater aerodynamic performance and a beautiful minimalist door design, the outside door handle is flush against the door surface. The tachometer display changes to emphasise priority information according to the selected drive mode. For example, in SPORT S mode, the tachometer displays enlarged numbers. The LC promotes eco-friendly driving with an indicator that lights up when the accelerator is used in an eco-friendly manner. After extensively testing and measuring the distribution of pressure on the palm during actual driving, we created a steering wheel suitable even for circuit driving. A beautifully ornamented leather shift knob, designed to fit snugly into your hand, is just another example of Lexus’s dedication to the details. One of the most premium audio systems in luxury cars, Mark Levinson’s® 13 ultra-high efficiency speakers ensure unparalleled sound quality that rivals even the finest concert halls. The LC 500 is powered by a robust 5.0-liter naturally aspirated V8 engine pumping out 470 brake horsepower and 530Nm of torque. The all-new 10-speed automatic transmission ensures that you will be in the optimum gear in any situation. A wide gear ratio range enables smooth and powerful start-off acceleration while allowing comfortable high-speed cruising. The LC 500’s driving position sits 80mm further rearward than convention dictates, while the hip point is positioned lower, creating an ideal center of gravity supporting driving excellence. Six-piston calipers on the front and four-piston calipers on the rear enhance braking power, so you can max your drive and still stop at the traffic light. The highly maneuverable LC 500 responds exactly in accordance to the turn of the steering wheel, providing even greater driving fun for you behind the wheel. The LC 500 cuts through the air with aerodynamic features, including aero stabilising fins, an active rear wing and the world’s first rear aero ducts. The LDH system creates faithful handling by enhancing steering response, so your vehicle is stable even when you drive at the limit. Select performance to match your driving style with four drive modes: NORMAL, ECO, SPORT S and SPORT S+. Protect yourself and your loved ones with the LC 500’s competitor-besting frame strength that has passed many high-level collision tests. To reduce risk of injuries to pedestrians, a sensor-activated safety system creates a space between the hood and the engine if an impact is detected. Know when vehicles are approaching from behind, even at higher speeds, with the next-generation Blind Spot Monitor. Collision impact is greatly reduced with 8 sensor-controlled SRS airbags lining the cabin, providing enhanced protection for all occupants. Take corners with confidence with the LED cornering lamp, which helps you spot pedestrians when entering an intersection. The models selected have the same features. Be the first to get the latest updates and promotions on the LC 500. Please provide your contact number.. Please enter a valid contact number.. Please agree to the terms. We will update you the moment we have any promotions or updates for this model. Have a great day ahead!